The Collective Obsessions Saga chronicles the extraordinary loves and intricate obsessions between two families sweeping a span of more than 140 years, all set against the backdrop of a Gothic seaside mansion in Maine. Follow the twists and turns of the Larkin and Sullivan families, who settle in America in the mid-1800s. John Larkin builds his vast business empire while daughter Molly and lighthouse keeper Colm Sullivan establish a connection that will endure for generations. Amidst murder, madness, perverse self-indulgence and avarice the two families struggle to free themselves from a dark legacy of secrets and obsessions. More than twenty years in the making, Collective Obsessions is a unique family saga set in the combined genres of mystery, the paranormal, historical romance, and dotted with a touch of the macabre and hints of classic Gothicism. 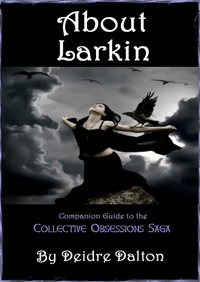 For more information, visit the Collective Obsessions official website or download the About Larkin Guide. Please Note: The cover image for the Collective Obsessions Saga was based on an artistic rendering by Rosabella (Night Shadow). The specific image will not be used in the official end-product book cover art, nor will it be utilized as such in the future. Deborah O'Toole also writes using the pseudonyms Deidre Dalton and Shenanchie O'Toole.